A few weeks ago I told you all about how excited I was to be moving into my first house all my own. Well, I'm still excited, but now there's a problem. I don't have any furniture! Everything I have is just clothes and knickknacks. Since my last post, I've been slowly trying to make my place look like home, but it feels so empty sometimes. Not only is there not much furniture to be had, but there aren't any people either. It's so quiet and too peaceful. Makes it feel less like a home. And it's not just furniture and people I'm missing. There's also a shortage of appliances! My rental doesn't have a washer, dryer, or refrigerator. And what does any girl fresh on the job and moving to a new place do? Look for the best bargain that she can find! I thought I found one. Someone had both a washer and dryer for sale for what I thought was a great price. My boyfriend went with me to check them out and then help load them in his truck if I decided to buy. When we arrive at the seller's house, the machines are in a dimly lit basement, and I thought they looked decent enough to buy. We get them loaded up, to my house and in my driveway closer inspection. They were a total waste of Cesar's and mine time! They weren't just bad...they were dirty, smelling really awful bad. To top it off the dryer was missing a part needed for us to even plug it up to see if it worked! "Let me go to the store and check to see how much the part is and go from there," my boyfriend, Cesar, offered. I stayed with my disappointing bargain buy while Cesar wen to buy the part. It was getting dark and I was hungry. When he finally got back, with the part in hand, he informed me it cost $125! "What?! That was so sweet of you to get it for me, but there's no way I'm letting you spend that much on this and we don't even know if they work. I can't deal with this. Let's just load them back up and take them back!" I said. I was getting more upset and frustrated by the minute. As we walked back to the truck, I looked in and realized there was suddenly not enough room to put the failed washer and dryer back inside. There were two huge boxes taking up space. It didn't register at first what I was looking at...and then it did. Cesar didn't just buy a new part, he bought a brand new washer and dryer for me! 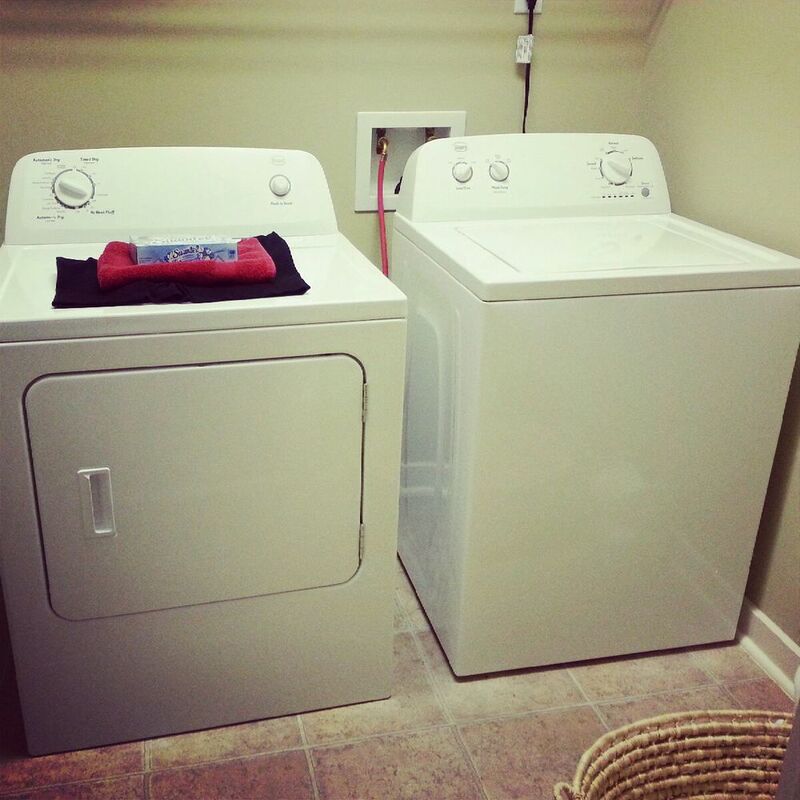 First load in my new washer and dryer! I had NO idea he was going to do that! I was a blubbering idiot! I started to cry and tell him how sweet he was and he asked me if I was surprised. I said, "Are ya kidding me? I had no idea!" After everything had calmed down and we had them in and lookin' good I said, "If I am crying over a washer and dryer imagine what a mess I'll be when you actually propose!" He smiled. I know that some might find it silly or even girly to cry over something like that, but it wasn't about the washer/dryer. It was the generosity and love that went into them. I didn't expect him to do that and it was a WONDERFUL surprise! To be honest I was feeling a bit overwhelmed at what all I needed for the house and I am thankful for the blessing Cesar is in my life.